The Lonely Crowd is the third edition of the /si:n/ Festival of Video Art and Performance, which was initiated in 2009 by the French-German Cultural Centre, A.M. Qattan Foundation, and Les Instants Video Numeriques et Poetiques. /si:n/ is the first Palestinian festival dedicated to video art and performance, and adapts new curatorial strategies and more refined institutional partnerships and cooperation. In this respect, The Lonely Crowd marked an important development in the festival’s short history – this year signalled a more defined identity, in part due to a fewer number of partnering institutions: those mentioned above, with the addition of the Khalil Sakakini Cultural Centre. Two main local curators from within the partnering institutions were also appointed: the Sakakini Centre’s director, Lara Khaldi, and Reem Shilleh from the Qattan’s Culture and Art Program. The Lonely Crowd proposed to question the failure of the moving image in relation to its makers and spectators, shedding light on issues of isolation, loneliness and alienation produced by different modes of viewing. As a departure from previous editions, nine new local artworks were commissioned and installed in various public spaces throughout the city of Ramallah, which helped anchor the festival both physically and conceptually. This was coupled with Instants Video, Celebration of 50 years of video arts, a travelling screening program and performance, curated by Marc Mercier from Instants Video Numeriques et Poetiques. Additionally, the Goethe Institut orchestrated Kamal Aljarfari’s The Credits of My Next Movie, a lecture in Ramallah, and a workshop at Dar Al-Kalima in Bethlehem around Aljafari’s project Cinematic Occupation – a reclamation research that traces Israeli and American films shot in Jaffa between the 1960s and today, where the original Palestinian residents only accidently appear in the fringes of the frame. 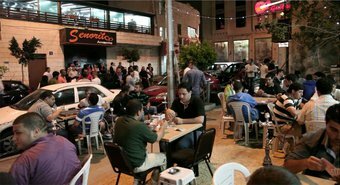 Although there were considerable efforts by the organizers to downscale the festival into a more digestible program,The Lonely Crowd still felt overwhelming for a small city like Ramallah; there were two to three events per day (ranging in thematic relevance and quality) over a two-week period in the month of Ramadan, an unofficial holiday centered around family gatherings and outings. As such, the festival opened at night after iftar (the break of the fast), with a curators’ guided tour of the video installations, strategically installed at various popular downtown locations. The attending crowd aroused the curiosity of onlookers, creating an interesting moment in which the very act of looking at the artworks produced something to be looked at. This sense was underscored in Noor Abu Arafeh’s single channel black-and-white silent video, Directions for Intimate Solutions or Seemingly More Intimate(2013), installed at the Mirage Coffeeshop, which explored issues of voyeurism. Abu Arafeh’s work had us walk through crowds of young men playing cards and smoking shisha, producing new opportunities of voyeurism for them, too. If only the video was set up so that the ‘intruding visitors’ could also peek back at the café crowds. Samar Haddad King’s Playground (2013), a four channel video installation and live performance, created a more confrontational viewing experience at the abandoned Harb House. The work was composed of live performances simulating torture by loud music (a method used to torture prisoners at Guantanamo Bay), a screening of ESPN’S film The Two Escobars (2010), a video game play station, and a video leaked on Wikileaks of a drone attack on a neighborhood in Iraq. Yet, as these distinct and intense components competed with one another for attention, sadly it was the tale of drug lords and football (The Two Escobars) that overshadowed the beautiful intensity and subtleties of the live torture simulation performances, arguably the strongest part of the artwork. The Lonely Crowd curators’ tour, /si:n/ festival of video art and performance, 2013. Offering a historiography of the medium’s pioneering artists since its invention by Nam June Paik in 1963, Marc Mercier’s Instants Video, Celebration of 50 years of video arts,made up of three screening programs, had the potential to open up a much-needed reflection and discussion on the medium. Instead, a looping program of 5 videos was installed on a TV monitor in the entrance hallway of the French-German Centre. They were impossible to watch by virtue of their location, which undermined the historical status of the works. 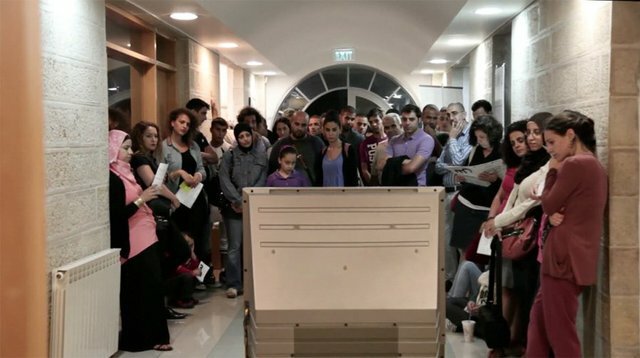 Most importantly, there was no attempt to engage or connect the videos to the history of the medium in Palestine, which was especially tragic since Palestinian Video Art: Constellation of the Moving Image, edited by Bashir Makhoul, had just been published by the Palestinian Art Court, Al Hoash. Leading the crowd with the sounds of a blowing horn that also playfully projected black–and–white illustrations, the passengers were then asked to let go of various sentiments such as ‘hate’, ‘judgment’ and ‘prejudice’, which many found naive, condescending, preachy and assuming. Yet there was something magical about the sounds of the horn and the image it projected on the building walls, the streets, the pavement, and the people it encountered on the street, who were happy to be part of something, even if they did not fully understand it. As the crowd unresistingly followed the bus rhetoric, others from the street began to wonder about the spectacle, which artist Khaled Hourani explained to them simply as ‘an artistic protest.’ Hourani’s seemingly objective description resonated. Why didn’t we resist or challenge the performance? Instead, viewers passively – and skeptically – followed it, and all the while a question loomed over the participation of the audience. Were we all part of an intervention in public space, or were we merely a lonely crowd in Palestine?